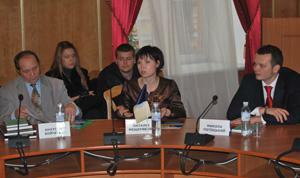 The round table discussion concerning Intellectual property rights protection in Ukraine has been held. On the November 18th 2010 at the Kiev National University T.G. Shavchenko with the help of Ukrainian Lawyers Association, intellectual property and advertising committee ULA, supported by Patent-Lawyer company P&M Partners, round table devoted to “Intellectual Property’s Current Problems of the Rights Protection in Ukraine” has been held. Mrs. Elena Kokhanovskaya - Doctor of Juridical Science, professor, member of the NAPrN in Ukraine, Deputy Juridical Faculty Dean of the Shevchenko Kiev National University in science work has given a grand opening of the round table. Mr. Nikolay Pototskiy who is the Legal Science Candidate and a Deputy CEO of “DD & I IP Agency” as well as Patent Council of Ukraine gave his welcome speech. After the Grand Opening list of the speeches to be presented at the round table has been announced. In such a way court expert, determiner of the “Intellectual Property Expert Bureau”, chairman of the Intellectual Property and Advertising Law Committee Mrs. Natalya Mescharkova, has told about the peculiarities of the expert testimony in court connected with the rights protection of the goods and services. Speaker has pointed out her attention several times on the correctives and accuracy of the question drafting which are given to Expert. As a result of Mr. Dmitriy Kartushin speech “Proves in the Disputes about the Recognition of Invalid Trade Mark License and Services” a live discussion between invitees took place. Further on there were speeches of Mr. Anotoliy Kodinets’s, Legal Science Candidate, Decent of Civil Law Faculty at the KNU, devoted to peculiarities of agreement conclusions in the sphere of intellectual property and Mrs. Ludmila Zaporozhets’s speech about the agent legal relationship. At the end of the event Irina Sysoenko, Patent Council in Ukraine, CEO of the patent-juridical agency “Brand-Group” gave her speech about “Acknowledgment of the Trade Mark as Illegal on the Basis of the Rights of Well-known Trade Mark”. Speaker has pointed out the reasons why it is necessary to acknowledge a well-known trademark as well as the ways of its protection by means of recognition the other label as illegal. In general, during the round table such questions as termination of in-advance trade mark international registration, proves in disputes about the recognition of invalid trade mark registration license and services, agent legal relationships, pay of the damages, carrying out the court expertise in spheres of intellectual property, information about the well-known trademarks and others. L egal protection of intellectual property rights is getting increasingly important with the current economy and business development trends. A well-grounded strategy for IP items use and protection will ensure a dynamic business promotion, competitiveness, will prevent unfair competition and create a solid foundation for the effective development under a reliable protection of Law. BrandGroup Patent & Legal Agency has an extensive experience of success in IP area. Our professionals are ready to protect your rights to and interests in any intellectual property in the State Department of Intellectual Property at the Ministry of Education and Science of Ukraine, Antimonopoly Committee of Ukraine, Customs Service of Ukraine, and in courts. BrandGroup can professionally and responsibly meet the challenges in the development and protection of your intellectual property both in Ukraine and abroad. We will become your reliable, highly skilled partner as we have for many of our customers, including many well-known and successfully growing companies which entrusted us to develop, protect and promote their intellectual property. We only offer the services we can deliver and fully perform our obligations on a timely basis. When communicating with a customer, we represent the company’s viewpoint rather than our own. Our work is based on respect for the customer, compliance with business ethics, personal approach and good faith. We are focused on our customers’ success. We do our best and even more. Our team primarily works to achieve the customer’s goals and strategic tasks which is fundamental for "BrandGroup" Patent & Legal Agency. Should you contact us for a qualified help in due time, you prevent the possibility of economic damage caused by illegal usage of the intellectual property by others. We only offer the services we can deliver and fully perform our obligations on a timely basis as we are based on compliance with business ethics and good faith. Copyright © 2019 BrandGroup. All Rights Reserved.